I was craving something carby for dinner (me? crave carbs? 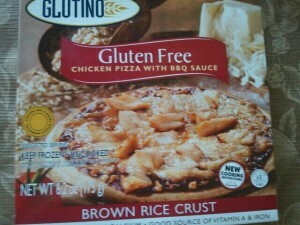 never (; ), so I decided to try the Glutino Chicken Pizza with BBQ Sauce I bought the other day at my Whole Foods trip. 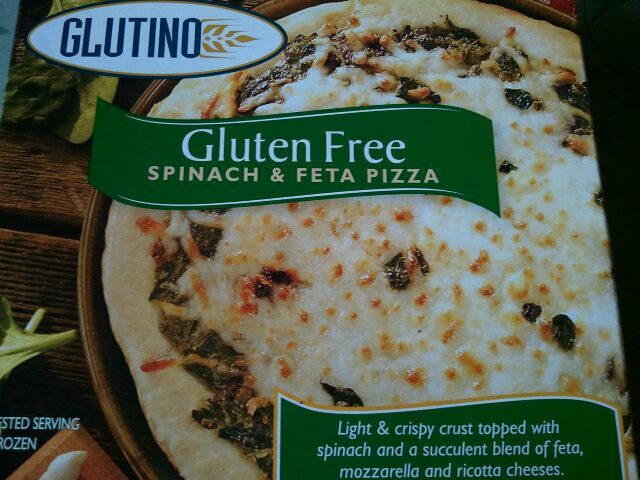 I really liked the Duo Cheese and Spinach & Feta pizzas that Glutino made, so I thought this one would be good too. I set the oven to 375 degrees and let it cook while I steamed up some broccoli on the side. Here’s how it looked frozen- there wasn’t a ton of cheese, and the crust was thin. The pieces of chicken looked small, so I was a bit skeptical at first. 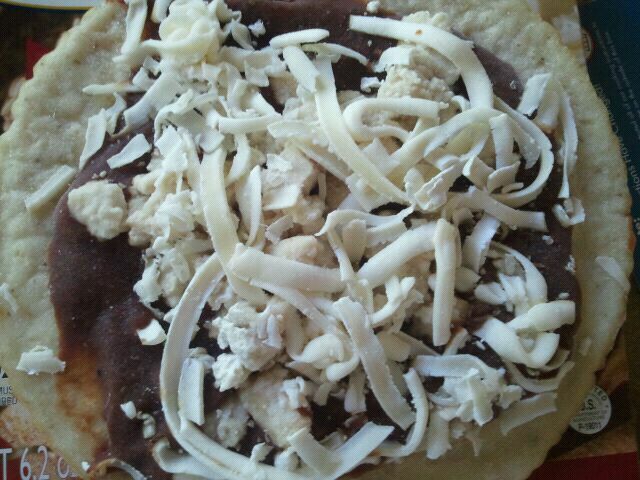 However, I found that they were just hidden underneath the cheese! I took a bite, and instantly fell in love. I honestly didn’t think I was going to like this as much as I did. It was AMAZING! The crust was crunchy yet soft, and there was a good amount of BBQ sauce on the pizza. The BBQ sauce itself had a tomato based flavor, and was sweet at first, but certainly left a bit of spice lingering. There was a good amount of cheese, which I liked because I personally am the type of person who would pull off the cheese on a slice of pizza (haha don’t hate me!!). The chicken was in small chunks, which were juicy, flavorful and chewy, but in a good way. Honestly, this pizza rocked. I am SO buying it again, even if that means driving all the way to Whole Foods to get one (or 3…). Everything worked together, and tasted wonderfully together. I felt like I was eating something that tasted like it was from a restaurant, and I liked that the nutritional information was pretty good as well! This one deserves it – a 5 star rating! What’s your favorite kind of pizza besides traditional cheese and sauce? I think this one is MY new favorite! First off, HAPPY ST. PATRICK’S DAY! I am, indeed wearing Green as I type this. 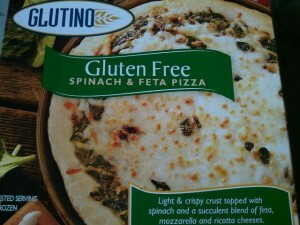 Moving on to some more green , the Glutino Gluten Free Spinach & Feta Pizza! I tried the Duo Cheese Pizza and thought it was rather tasty, so I decided to buy the Spinach & Feta version. First off, I thought it was funny how it came out of the box. Look how off centered the topping was! 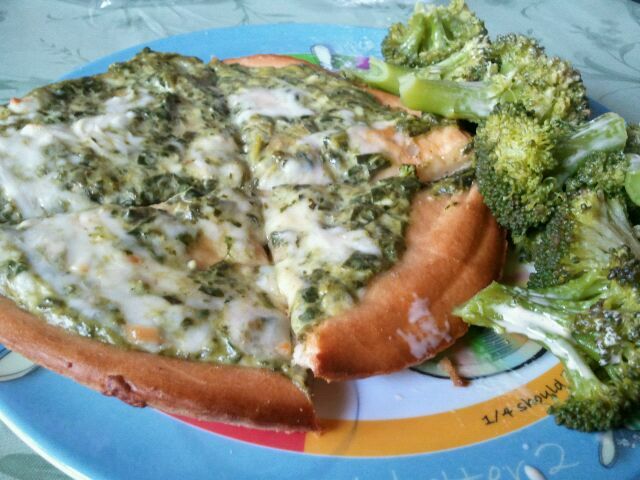 Anyway, I cooked it in the oven and smeared the topping a bit more evenly on the pizza and paired it with some steamed broccoli. I felt all the green was appropriate for St. Patty’s Day. Accidental butter on the crust. Oops. First I looked at the pizza, and saw it was a bit greasy. However, not the best decision to blot the pizza, as some of the cheese stuck to my napkin, so I left it as is (oops!). At first bite, I thought it was kind of bland. But as I continued to eat it, I actually really enjoyed it. 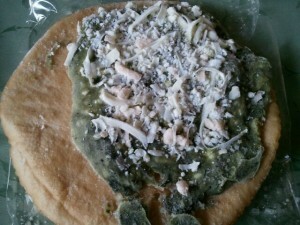 The spinach and the cheese were very rich, and really quite salty. The cheese was stringy and with the spinach had a very parmesean and mozzarella cheese-like flavor. The edges of the pizza were very crunchy and crisped up fast. As for the flavor of the crust, it was okay. It was kind of like a plain breadstick. 1 pizza is 300 calories, 11 grams of fat (5 saturated), 38 grams of carbohydrates, 2 grams of fiber, 2 grams of sugar and 11 grams of protein. What’s your favorite kind of pizza besides the tomato sauce and cheese combo? 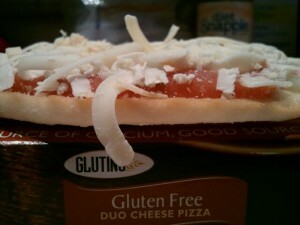 Reviewing today, Glutino Gluten Free Duo Cheese Pizza! What sparked me to buy this? I actually have no idea! It looked interesting, and I’m pretty sure I never had a gluten free pizza before. 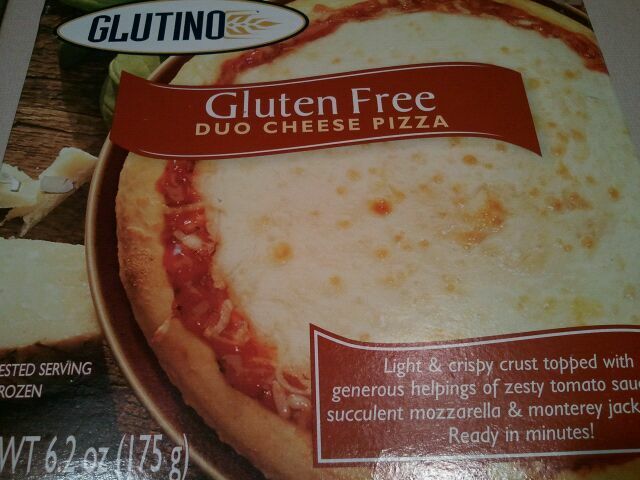 Sometimes I really enjoy gluten free products, and other times, the consistency throws me off. Anyway, I was willing to give it a try! 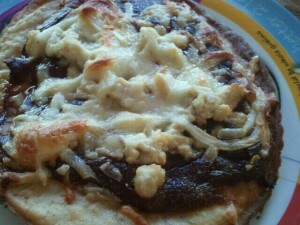 I happen to like thick crusted, chewy/doughy pizza as opposed to thin crust. However, who knows, it could still be super yummy! So I cooked it at 425 degrees F for 12-15 minutes as the box told me to, except at 9 minutes I noticed it was getting very crispy. I transferred it to a pan for the remained of and here’s how it looked. 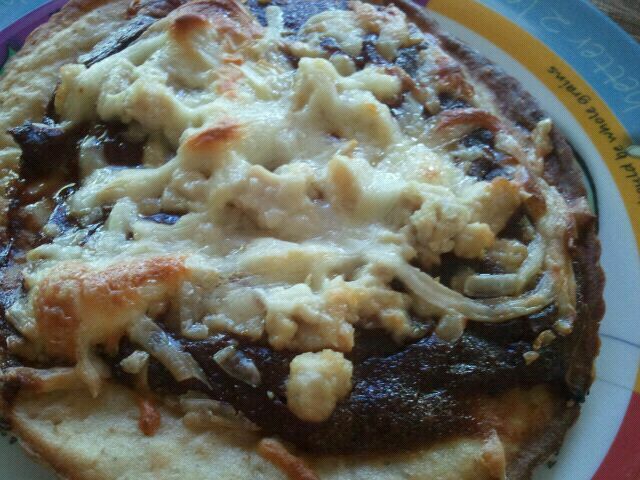 I steamed up some veggies on the side, and cut the pizza in fours to eat. One thing I liked was that I noticed the pizza wasn’t super greasy, which is a turn off for me. 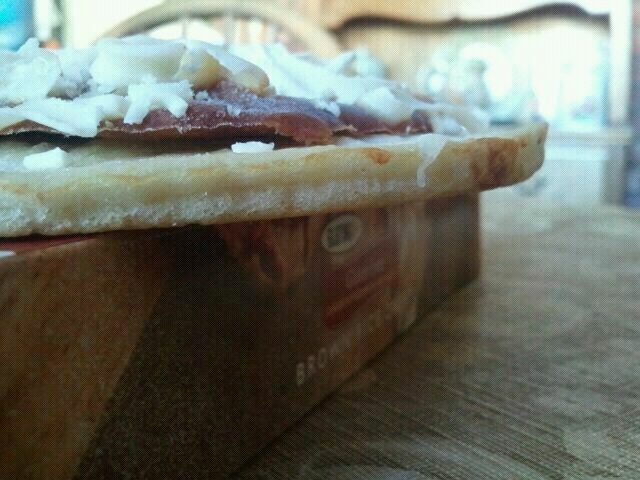 The bottom of the pizza was crispy, and the top part was rather doughy and soft. I didn’t know if this was becasue I transferred it to a pan or not, but either way it was delicious. 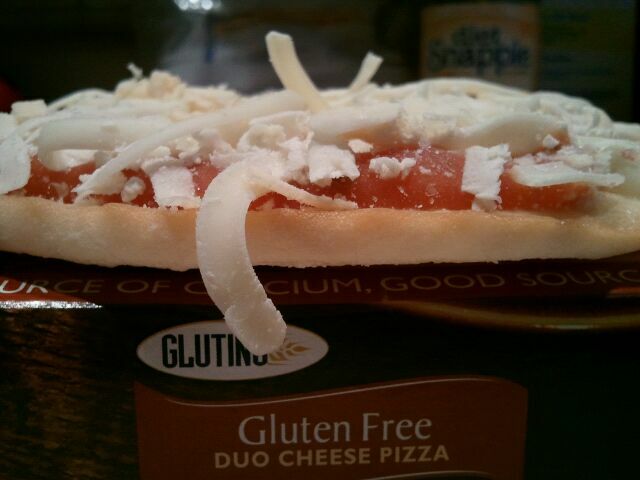 The cheese was chewy, and not super stringy, it stuck together on the pizza quite well. 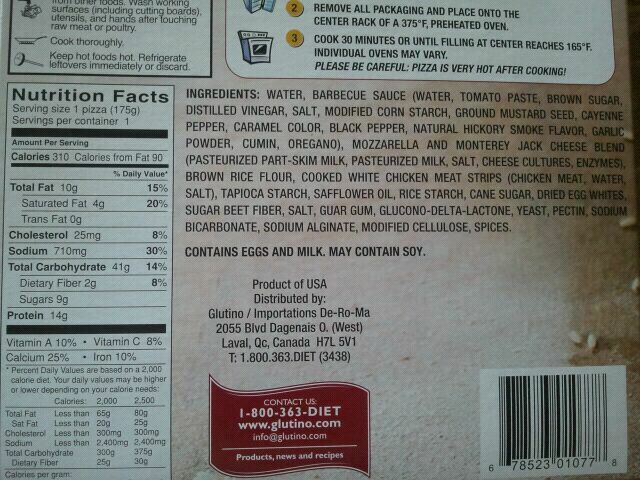 I predominately tasted mozzarella cheese, although the ingredients say that there is monterey jack cheese as well. 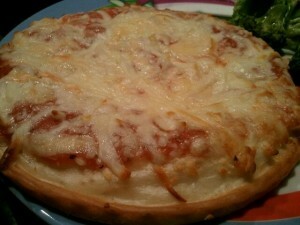 Under the cheese was a smooth, flavorful sauce, that had just the right amount of zest to it. 1 pizza is 310 calories, 12 grams of fat, 40 grams of carbohydrates, 1 gram of fiber, 4 grams of sugar and 12 grams of protein.